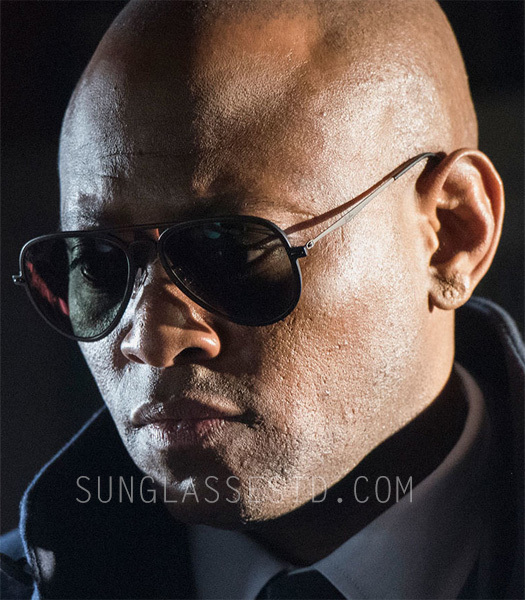 Omar Epps wears a pair of Ray-Ban RB4211 Aviator Light Ray II sunglasses in the TV series Shooter. In this photo from Season 1, Episode 1, Epps wears the black/grey lightweight sunglasses with classic aviator shape have LightRay Titanium temples. In the series, Omar Epps plays Isaac Johnson, a Secret Service Agent also Former Commanding officer of Force Recon Marine and MARSOC CSO of Bob Lee Swagger (played by Ryan Phillippe). Shooter is a USA Network tv series, based on the novel Point of Impact by Stephen Hunter and the 2007 film of the same name. The series premiered on November 15, 2016. Omar Epps is best known for his role as Dr. Eric Foreman in the series House.